What was new at Searchology? 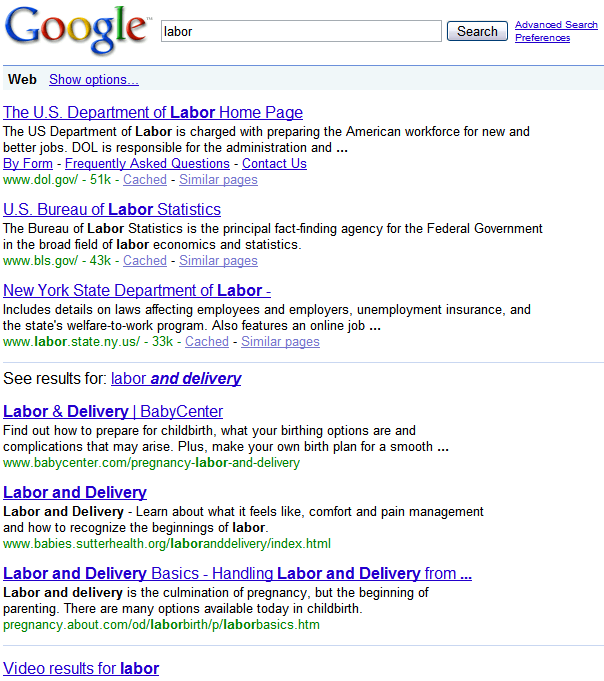 Google launched 3-4 new features at Searchology today. You can read about Search Options, Google Squared, Rich Snippets, or Sky Map in my previous post. But I also pay attention to the small things that Google said. I noticed several tidbits that I don’t think we’ve said in public before. Finally, there’s an even more aggressive feature (internal Google code name: “Spellmeleon”) for when we really think the user messed up. In that case, we’ll include a couple results for the corrected query first, then results for the user’s original query. Take the query [ipodd] for example. 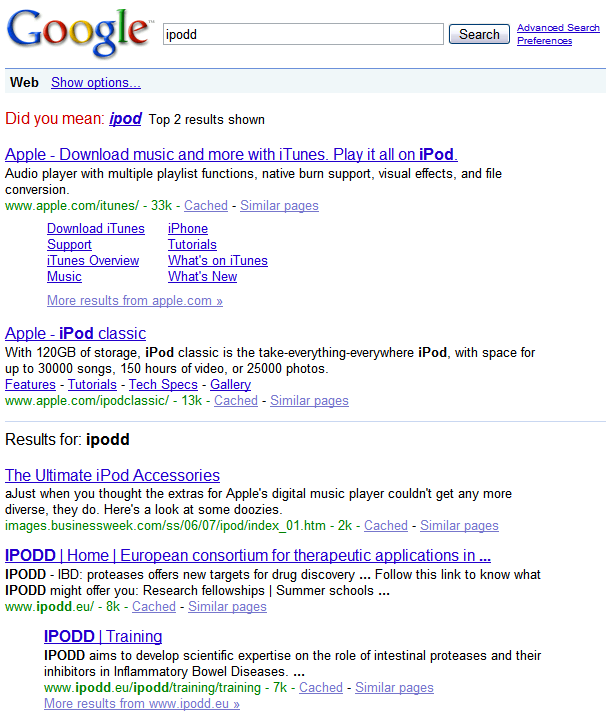 Our algorithms strongly suggest that the user meant to type “ipod” so we’ll include those search results first. – Pat Riley also mentioned that if you do some of these search improvements in a naive way, the additional server load is equivalent to if Germany and France just appeared out of nowhere and started sending all their daily searches to Google. So you have to do some smart things to make this search improvement viable. – Scott Huffman revealed that mobile search results are blended between results from the mobile web and results from the regular/normal web. Makes sense, but not everyone knows that. – Marissa Mayer mentioned that about 1 in 4 searches triggers a universal/blended search result. – Marissa also mentioned that 40% of searches on any given day are repeat searches for that user (I’m not sure if that means repeated that day, or just repeated compared to past searches). She mentioned that to explain why SearchWiki can be useful, because if you’re repeating a search, you may want to customize the results to your taste. Marissa also said SearchWiki receives hundreds of thousands of annotations each day. – Someone asked what Google is doing to crawl the deep web. My advice is to check out Jayant Madhavan’s paper to read more. Here’s a direct link to a copy (PDF) of the deep web crawling paper. – Someone asked how important is it to search video with a text search query? Google did this for political videos during the election and I’d really like to see more in this area. Together with fellow Googler Wysz, I’ve made about 50 videos to answer common webmaster questions. Right now it’s a pain to create caption files for those videos. If Google could give me a rough speech-to-text transcript (with timecodes) and let me edit the transcript to correct errors, that would be fantastic. Then someone in Turkey could read my videos even if they didn’t understand English. I would love that. – In answer to a question from Vanessa Fox, Kavi Goel mentioned that Rich Snippets will roll out slowly at first (probably beginning as a whitelist of trusted sites) but that over time, more and more sites could show up with rich snippets. 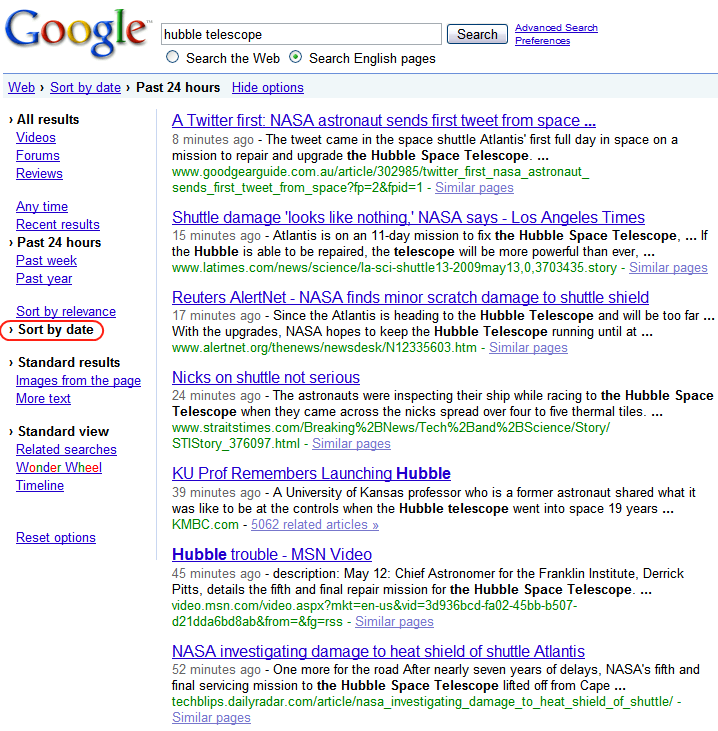 You can read more about rich snippets on the Google webmaster blog or see example code. And if you’re really into RDFa or microformats or rich snippets, the folks at O’Reilly did a nice interview with two Googlers (Othar and Guha) involved with the project. – TechCrunch got some video of Google Squared. The whole video is interesting, but the part that I thought was funny was 4 minutes, 12 seconds into the video where the Google demo person signs into Google Squared and Michael Arrington does the polite “password lookaway” and looks at Steve Gillmor, who is also doing the polite password lookaway. – If you want to see the slides from Searchology, it looks like Yvo Schaap took the time to snapshot each slide as it appeared. Until/unless Google releases the slide deck, that’s where you can see the slides unofficially. My favorite is slide #8. Great that you wrote it out. The GWT GUI is redesigned from ground up! Plus now it includes historical keyword/ranking data… would be super if they could include historical backlinks too, for those who want to diagnose whether a traffic halt is due to something in the link-scape or someone in the google-plex…! Nice breakdown! A lot of good stuff. What about RDF, micro formats? I’m glad that now google is join Y! on that. What would you say web master of ‘media’ sites start using them or not? PLEASE make these *optional* and don’t force them into the organic SERPs. E.g Video results has an *optional link* but Google often forces them into the SERPs, shunting relevant results down and it’s getting worse as time passes. Why not have simple link like you do for misspellings? When I read your tweet yesterday night I wasn’t so sure if it was a joke or if at Mountain View you just did a lot of extra work. I can say the second one. They are very interesting feature, expecially the Spellmelon feature. This sound – as you said – a great improvement to identify and defeat the spammer and typocoder. Search process must be natural, not artificial. Thanks at all the team. Matt, could you use GrandCentral/Google Voice’s speech to text functionality for your videos? For the time being you could call yourself to see if it works at all, and it might make your life easier. All good stuff, lots to take in, much appreciated. The date filter–I use quite a bit. It helps for finding more timely news instead of searching through the entire index of things that may have information years and years old. For instance, a search for conversion optimisation gives “Did you mean: conversion optimization Top 2 results shown”. However, it doesn’t do the same when searching for search optimisation, instead returning “Did you mean: search optimization” without the top 2 results. Dave (Original), you may be a savvy power searcher, but most people aren’t, and we need to help the users that can’t spell/type correctly 100% of the time. Andrea Moro, thanks! James Morell, we’ve tried some tests with that, but then you don’t get the accurate timestamps out (as far as I know). okinawa, I like the time slicing a lot too. Liam, I’ll try to pass that suggestion on. Matt – Your comment about most people not being power searchers needs to be recognized by a lot more people. I do a lot of testing in that area and it’s mind-boggling for me what some people type! Thanks for keeping us up to date Matt. Will these options truly be rolled out, or just in bits and pieces. It appears that I can see the “Show Options” on search, but most of my colleagues cannot. Also are these changes here to stay or still in the testing phase? A lot of times we see the new things that are show for a bit then fade away as fast as they were implemented. Thanks for this info Matt – I particularly love the “Spellmeleon” feature… great for those of my customers whose domains have been targetted by those spamming mispelling miscreants. Matt, is there any way to disable that feature when people type something in quotes, or possibly within another character set? I clearly indicated (at least I thought) that I didn’t mean “WeBiNar”. The mixed-case alone should be a giveaway, never mind the quotes. Maybe something like !WeFiBar! is in order here (or some other surrounding character set to indicate that I’m looking specifically for what appears to be a misspelling)? Sorry to vent dude, but this has been driving me nuts for some time now. Great bunch of features that has been rolled out, tried a few and really like them. I was wondering why Google never added “Learn more” next to more options/hide options or below the list of various filters. Everytime Google rolls out a feature to end users, I am aware it always provides a link along with it so the users can be educated on what/when the feature went live and so forth. I really wonder its missing for this new option though. Eg. For SearchWiki, there is a Learn more link http://www.google.co.uk/support/websearch/bin/answer.py?hl=en&answer=115764&&tbo=1 ! Power users can get used to new options without Google educating them, but noobs? @Dave (Original): That’s why I set the Search Preference Number of Results to 50 results. The results load slower, but the speed difference is imperceptible on a high-speed connection. Perhaps google should have an opt-out feature for videos and other stuff. New search features are great but it would be outstanding if a little more Google brainpower could be allocated towards fixing your custom search engines. Any kind of official response on this matter would be very much appreciated. Excellent new features. And thanks a lot to Yvo Schaap for the slide snapshots. Sometimes I think Google is a little arrogant, but I have to say those new features show clearly why Google is the better search engine… It proves that Google is constantly improving the experience for the common user. Again, I hope those improvements include (some day) better communications with the webmasters through the Google Webmasters Console. It is really needed. I like the new features. Sometimes I am not the best speller in the world…even though I try to be! I am a power-user, or a soccer mom, or a student or a boss. Could I select from profiles that help me guide which types of search “improvements” appear on my page? My favorite is Google Squared. Look forward to full release. Wonder if its just googlebase? Matt, you got me all excited about sort-by-date. But it is only one-direction, to sort by most recent to least recent, and it only works when you first filter to recent results. That’s not much of a leap, given that it was always possible to filter to recent results in advanced search. What I want is to be able to look at older results–especially when I’m using web search to perform research. I’m guessing that’s a much harder problem, given what I understand of Google’s indexing approach, but I’d be curious to know if the design decision was because of technical or usability reasons. Err, I think you mixed my post up with someone elses. Here is my question again. Video results has an *optional link* but Google often forces them into the SERPs, shunting relevant results down and it’s getting worse as time passes. That’s a cool search engine revolutions… hope to see something more in the future. I’ve also noticed that Google is now indexing pages instantly. Matt, why no disclaimer on your new Blog? Timeline makes searching for current news possible; I love it. I think more casual searchers will utilize the options; there is room in the average human capacity to search more definitively than using keywords alone. Great job keeping us updated -thank you. SEFL, dude, why not read the post BEFORE asking redundant questions. I see so many spam videos appearing in Google search results. These videos are nothing but promotional videos that have a website URL in them and nothing else. Even if there is some video content in it, it is for only promotional use. And I have seen many spam sites being advertised in videos. Spam sites cannot Rank good in SERPs, so they simply use Youtube to let their spam videos top SERPs, thus getting traffic in directly. Thanks for the update. I agree with the optional video suggestion. There does seem to be more and more promotional spam videos on YouTube that get to the top of the search results simply by the fact that they are on YouTube. Gotta say that I really like the update to Webmaster Tools GUI. Big improvement. Thanks for this post Matt, nice to have the interesting tidbits. Wow, I really like the search by date feature…this helps if you are researching a recent news story, market data, etc…Thanks for the heads about all of the new features! Nice post, Matt! By the way, I just noticed a “bug” in Google Analytics. If I try to export a PDF using the left button and choosing “save as” it always generates a default report from the last 30 days (even if I chose a different time range). Dave (Useless), before you go off blindly assuming things that you know nothing about and taking cheap shots, actually try the syntax with the example I posted and you’ll see that it doesn’t work, either the way Matt posted (which I had actually tried first along with a series of other things before I made the comment…of course, the only reason I have to explain this is because intelligent people would have understood that this was implied). The reason I brought up the phrase in quotes is because putting a phrase in quotes is supposed to match exact phrases (which, again, intelligent people understand). That would also suggest that typoes would be expected when doing an exact phrase search (something useful when detecting cross-post forum spam since most forum spammers can’t spell). Seriously, Matt, can you please shut Dave up? He’s not here for any other reason than to get on people’s nerves…including yours (he’s taken cheap shots at you on more than one occasion, along with a number of other people who didn’t deserve it). I know it’s your blog and all that, but he’s been doing this for years and it’s getting really old. Matt given what happend re outages on the 14th maybe you need to employ a few CCIE’s or serious telecom players with some proper network chops – and spend less time on cute chrome gimicks. Hi Matt, I really love the spellmeleon feature. I recently saw an Interview transcript of a leading guru where he emphasized the importance of videos for traffic generation. I am sure you have done a lot of work to not show the spammy videos on top of the results. Meanwhile I recently saw a massive spam attempt at google. We discussed it here. But now its all gone. There were some domains having lots of sub domains and displaying in google results for 3 to 4 word phrases. I waited for 2 days for those results to go but then i reported it in detail to google using the spam reporting page. I am sure you got that and removed all those links. But you didn’t even mention that, so how would Matt know you have? Mind reading perhaps? RE: “cheap shots”. I suggest you stop dishing them out, if you cannot take them . One only has to read your senseless rants here, your blog and many other forums to see the “hypocritical fool” you are. They say that one’s own medicine is a bitter pill to swallow. Dave (Useless), wrong again. Get a clue, then repost. By copying/pasting a generic response that takes no real thought, I use the same number of brain cells that you used to come up with whatever ridiculous thing you’ve said in the first place. Primary School kids do that when they are made of fool of. I.e avoid the issue and resort to name calling and factoids. Enough flame and name calling. Dave Original is the man! I have a question about redirection. I have a site in geocities that is well ranked in google. The problem is that geocities is closing later this year and they dont allow 301 redirects. Whats the solution to move a website from geocities to another host without loosing google rankings? In this case a meta refresh with time 0 like ( ) would do the trick? Google would consider this meta refresh like a 301 redirect? How can I upload my avatar like you have done? Google would consider this meta refresh like a 301 redirect? I hear complaints about this “A LOT” on my non-tech savvy forum, oh i searched xyz yesterday and found a really brilliant site now when i search it again i can’t find it. When i tell them the site probably got penalized for buying/selling a link, they look at me like i’ve got 2 heads. They are slowly learning.. If you find a great site, bookmark it just in case because your chances of finding it in Google again are often slim. It moved 22 positions in 20 minutes = Frustrating. I think spellmeleon is great. Like you said, i think it will deter alot of spammers that entice click from unaware searchers who assume they have spelt something right, when in fact they may be clicking on a malware/spammy site. The only problem is that a number of my sites attract alot of visitors through mispellings, despite the site containing correct grammar. How will this feature affect my mispelling and long tail search traffic ? Or, one of another thousand reasons. Ever heard of Browser History? Well, this isn’t the “proper place”, in fact there is no “proper place”. Google has an official blog, or there are about 1 Million SEO forums, where they state “best guesses” as fact. James Watt, just do what is best for your visitors. Google is NOT some big bad monster just waiting to penalize sites. If YouTube was not a Google owned property, would its results be so prominently featured in the SERPS? I recently Googled a term I’m targeting with one of my new sites (contact me directly if you would like the term, Matt), and 2-6 of the top ten (depending on the day) are YouTube videos. Now, if I was looking for a video, wouldn’t I put that in my query (my query has no inherent relation to video)? Or use video search? If YouTube was not a Google owned property, would its results be so prominently featured in the SERPS? I bet not. It sure as hell didn’t when Google didn’t own it. I find it infurating that highly relevant content is be shunting down by Google lowering the bar for YouTube vidoes. It’s a direct conflict of interest that Matt refuses to address on this Blog. Hence his non-reponsive Political type answers to my questions on the matter. @Dave it isn’t very easy to figure out if a video is relevant or not. Also I really like these faqs. It provides more transparency to an already transparent company. I am a bit curious how they managed to lower the load on the servers. I guess in order to really know that I have to work at Google. Wow what alot of changes your team has come up with. It definitely shows that Google is on the ball and being more “real time”. I think those implementations are both extremely useful for the user and webmaster. As the web evolves and time related content becomes even more common then it already does it can be quite useful to find up to date information about a topic. I can also see those results being even more useful in case of an event that has not had much media coverage. Good stuff, Matt! But, I’m afraid you missed a bug. I’ve tried a search like [site:domain.com] within the past 24 hours and more than 10,000 pages were returned. But a following search for one of these pages, even a very specific one (e.g. page title in double quotes), has given no results. Isn’t that unusual? I couldn’t find an explanation for that. Google’s on-line docs suggest to use the site: operator to check whether pages have been indexed. But, once indexed, I thought they should be returned also by a search, which doesn’t use the site: operator. Or I got something wrong? The Google Wonder Wheel is absolutely awesome Matt… I will be using it often! Also, please add me to your subscriber’s list. Everytime I tried to subscribe to your rss/email feed, I was taken to your source code page. What happened to Related Searches? They disappeared this weekend from the Options sidebar although they are still mentioned in the Google Search Help pages. I typically liked wonder wheel. For some searches it does not come……..could you plz tell me when it is vissible? Few days back it was not vissible but today it is…….strange! a. A link to a secure cart. b. A “more” link on an article snippet where there is already a main article title link above it. c. A paid link. We are to be penalized for selling advertising? d. Links to print pages, duplicate contact forms etc etc etc. Why no public statement and discussion on this is so more important. It seems to me a massively useful tool used by most webmasters responsibly, has now been turned into a sword of PR death because of some websites PR sculpting. The sad fact is, those sculpting will simply find a way around this change, whilst the rest of us….. what to do? Matt, please speak up on this issue please. Sounds like there’s lots of interesting things coming in the world of Google search…the Wonder Wheel looks fab! Is there any way to get a word excluded from the triggers for Spellmeleon, a main part of our online and local advertizing goes around our key word which has now been turned into a spelling error and pushes people to our competitors? I have some images cached onto Google search since June from FLICKR that I want removed, although the original images have been deleted from FLICKR the thumbnails are still showing in the search. I have requested on 109 occassions through the webmaster but they have been denied. What can I do as one of these images is embarrasing for my wife and I. It is also showing up on safe search which is not right. How come I do not see the WonderWheel all the time when I search Google? Is it time or query specific? What is the criteria for it to appear in the More Options?